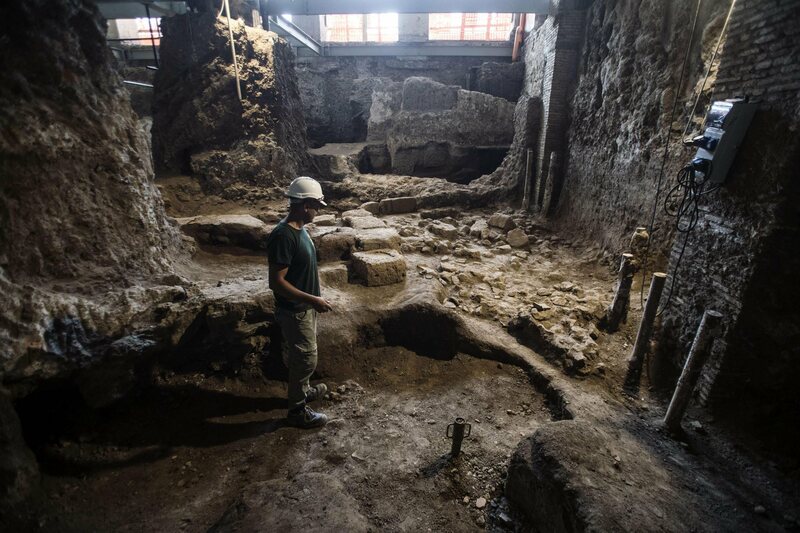 Roman police have discovered tons of refuse, everything from household trash to industrial waste, illegally dumped in the 2nd and 3rd century A.D. catacombs of Tor Fiscale, an archaeological park in east Rome. Situated on the Via Latina near the junction with the ancient Appian Way, the Tor Fiscale park is part of the vast Appian Way Regional Park. The small park is dense with archaeological riches. It is at the crossroads of six Roman and one Renaissance aqueduct whose arched galleries dominate the landscape alongside the 13th century tower that gives the park its name. It is replete with remains of ancient luxury villas, homes, tombs and underground caves dug out of soft volcanic tufa. Initially carved to quarry the stone, the caves were used by early Christians for gatherings and burials during the imperial era when the religion was viewed with suspicion and its adherents sometimes persecuted. Authorities came to suspect something was rotten underground during an investigation of illegal car scrapyards and waste disposal rackets in the area. 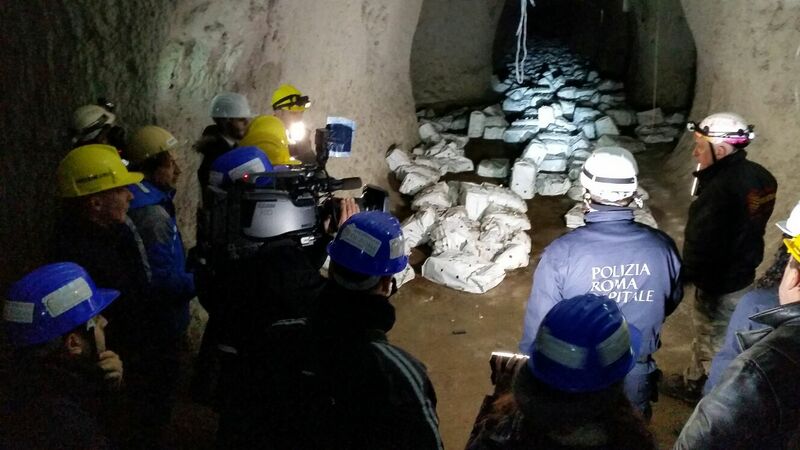 On January 26th, about 20 people — police officers, personnel from Italy’s Regional Environmental Protection Agency (ARPA), municipal workers and members of the archaeological speleology organization Sotterranei di Roma (Undergrounds of Rome) — worked together to explore miles of the underground tunnels. They found a shocking amount of waste, including old refrigerators, mattresses, electronics, tires, batteries, hundreds of bags of organic materials full of various molds that may have been used in the cultivation of mushrooms. 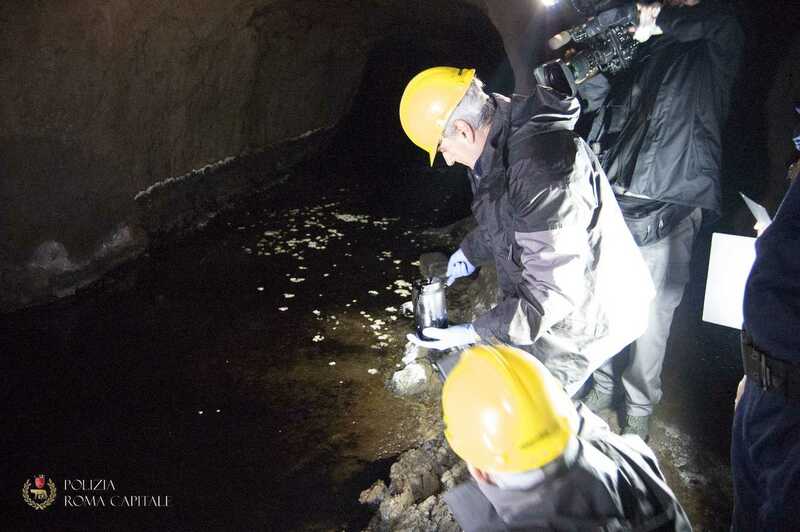 In one of the deepest tunnels, they found a veritable lake of greasy black goo that is likely used motor oil. On the surface alone this lake of hydrocarbon pollution covers about 200 square meters (2,150 square feet), and preliminary analysis found the lake is more than a foot deep, so the total volume of toxic filth in this one spot alone is something in the neighborhood of 800 cubic meters (28,250 cubic feet). 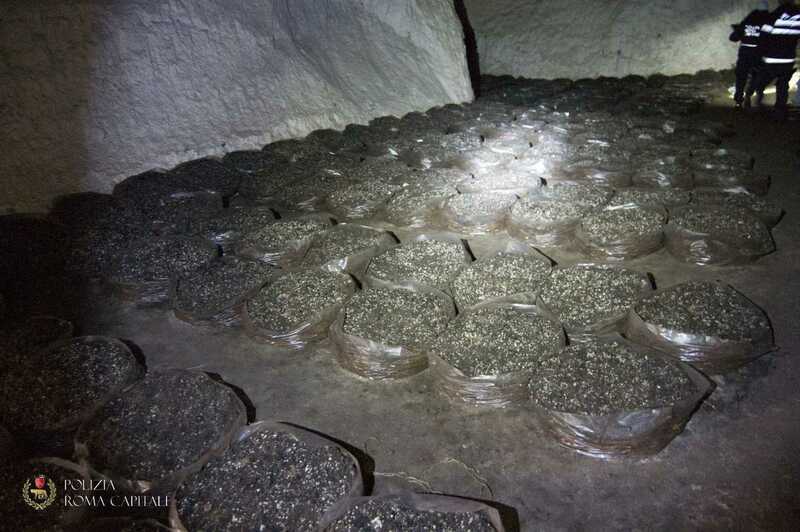 At some points the vaults of the tunnel appear to be impregnated with the goop, suggesting it was dumped from above rather than transported deep into the caves. The team took samples of the fluid to identify it and they will examine the surface to locate the entry point. There will also be extensive testing to assess whether the oil has seeped into the water table. After making the shocking discovery, police used drones to fully explore the network of bat-and-mice-infested tunnels to try to establish the extent of the dumping. It is thought that local businesses and residents have been using the site to cheaply dispose of their unwanted goods for years. Police even discovered that unscrupulous dumpers had drilled shafts down into the caves from above, which they used as rubbish chutes to quickly dispose of their unwanted goods. Authorities have closed the entrances to the caves on Via Demetriade and Via di Torre Branca, but of course that won’t stop people from using their homemade garbage chutes. 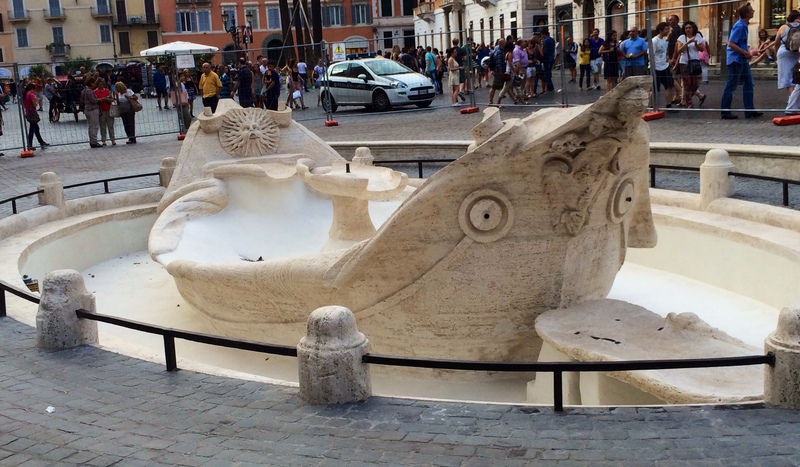 The municipal police are investigating the case in the hopes of finding who is responsible, at least most recently, for this ruthless assault on Rome’s cultural history and environmental health. 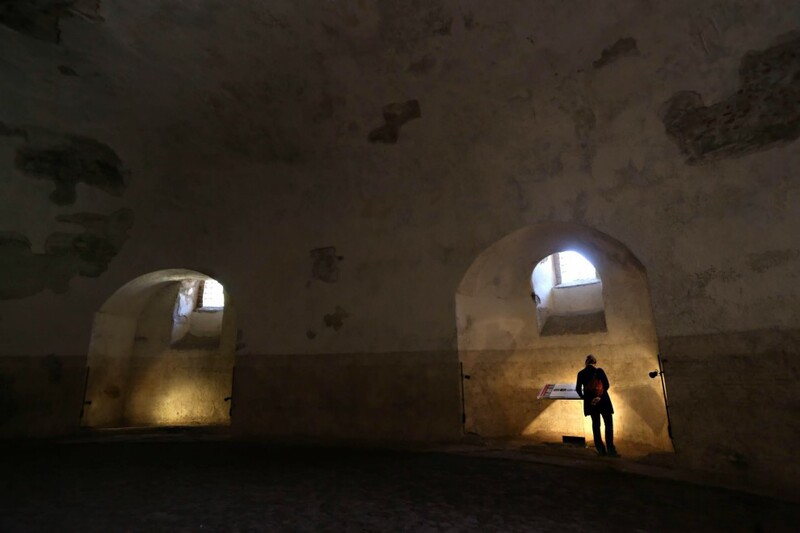 For the first time since it was discovered in 1900, a monumental ramp built by Emperor Domitian in Rome opened to the public on Tuesday, October 20th. 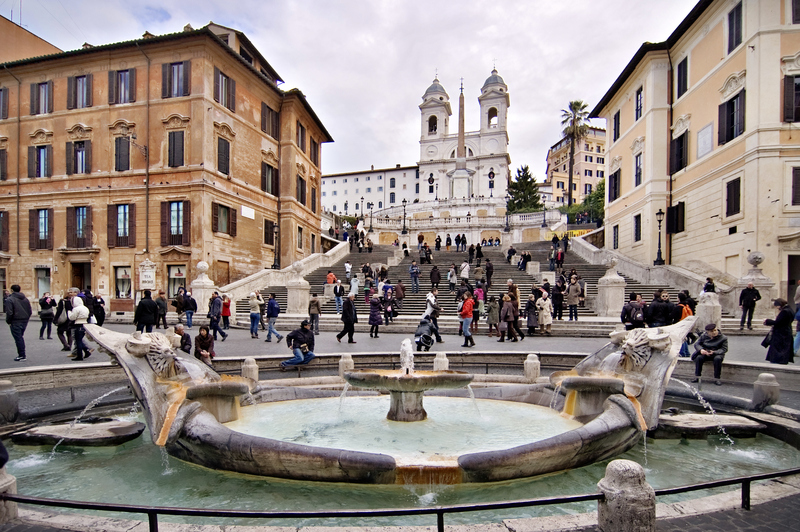 Domitian built the ramp in the second half of the 1st century A.D. to connect the Roman Forum, the administrative and political heart of the city, to the imperial palace complex of the Palatine, the city’s center of power. With high walls flanked by storerooms, the imperial ramp went up seven levels with six turns between them and was as much as 35 meters (115 feet) high. Of the seven original ramps levels, four remain, but they are more than sufficient to convey the majesty of the space and the symbolic significance of the steep ascension from popular politics to imperial might. 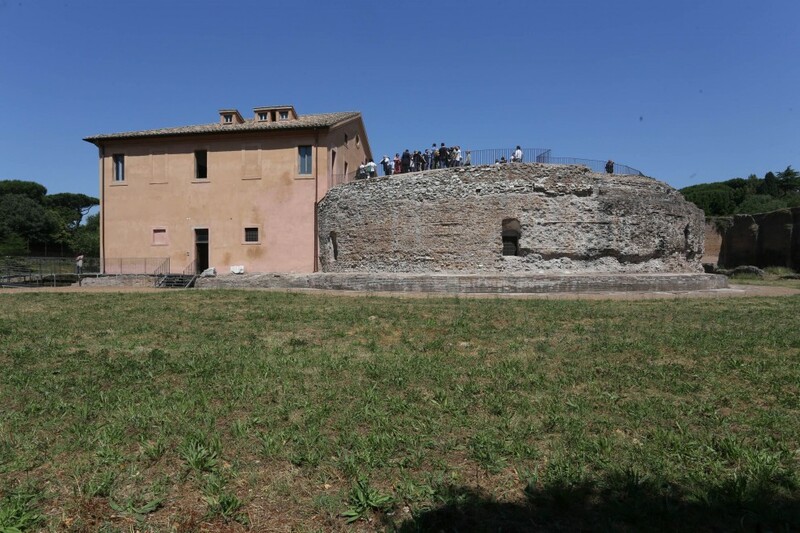 Visitors who walk the ramp will emerge atop the Palatine to a breathtaking view of the Roman Forum that before now regular folks haven’t had the chance to experience. Also restored is a great hall which in the early Middle Ages was converted into the Oratorio of the Forty Martyrs, dedicated to the Forty Martyrs of Sebaste. 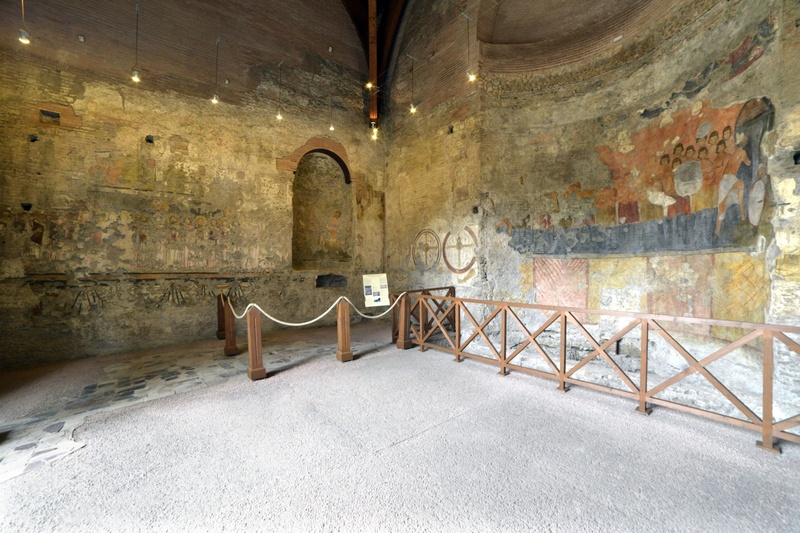 Built no later than the 8th century, the Oratorio is adjacent to the Byzantine church of Santa Maria Antiqua, famed for its rare frescoes, and signficant portions of the Oratorio’s original Byzantine frescoes have survived as well. They date to the 8th and 9th centuries and depict a procession of saints and possibly St. Anthony of Egypt. 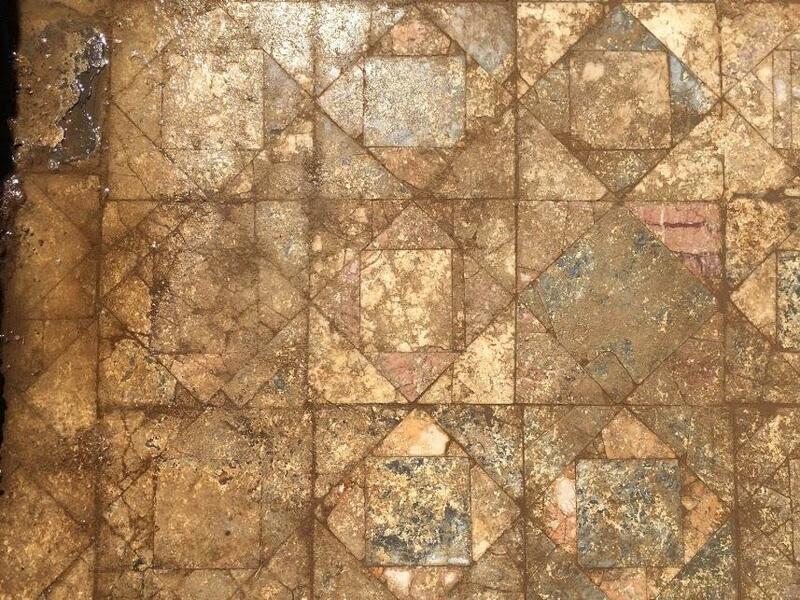 The floor is made of repurposed marble fragments in a random jigsaw arrangement. The Oratorio has been accessible to the public in a limited way before, but just on its own. 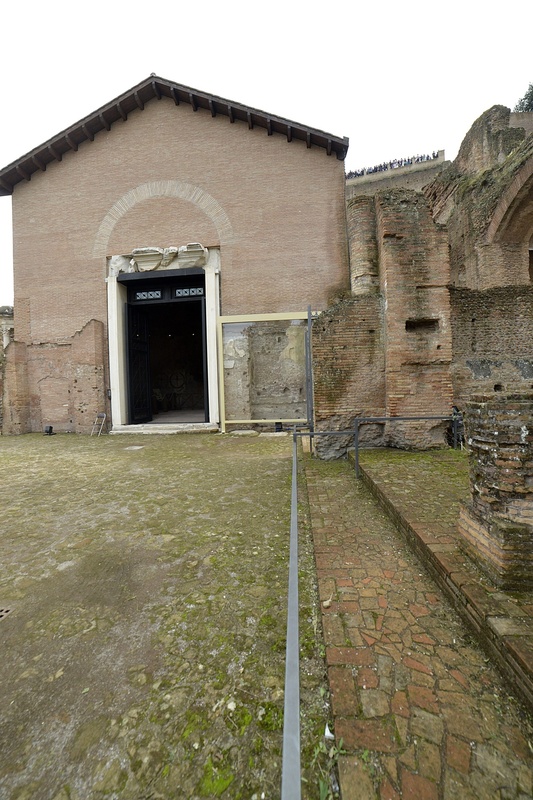 The new restoration has reintegrated it into the ramp, making it the entrance to Domitian’s complex. 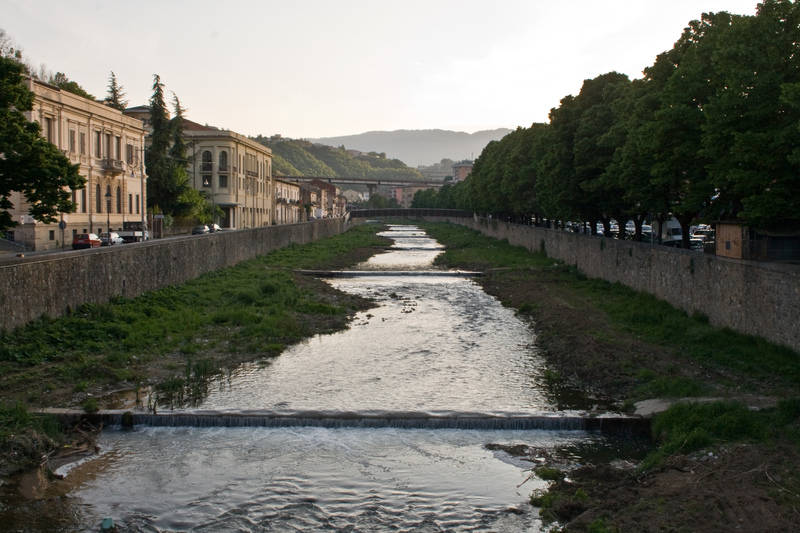 The ramp was discovered by architect, engineer and archaeologist Giacomo Boni. 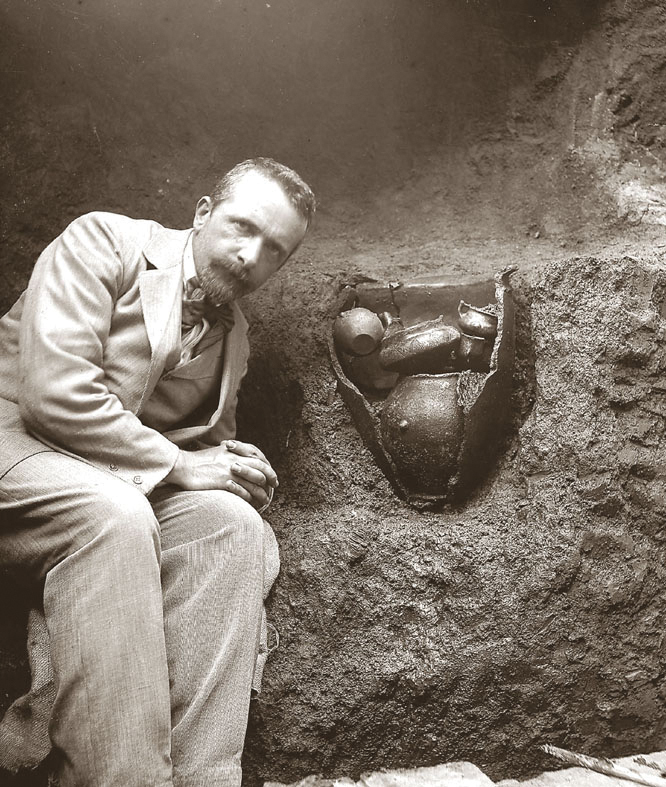 Boni was appointed director of excavations of the Roman Forum in 1898 and he dug until works were interrupted by World War I in 1916. The years between 1899 and 1905 were particularly intensive. 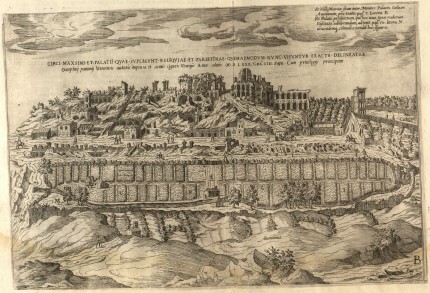 Boni made major discoveries during this time, among them the Lapis Niger and Vulcanal, the Regia, the Aedes Vestae (shrine of Vesta), an archaic necropolis next to the temple of Antoninus and Faustina and the Byzantine church of Santa Maria Antiqua. 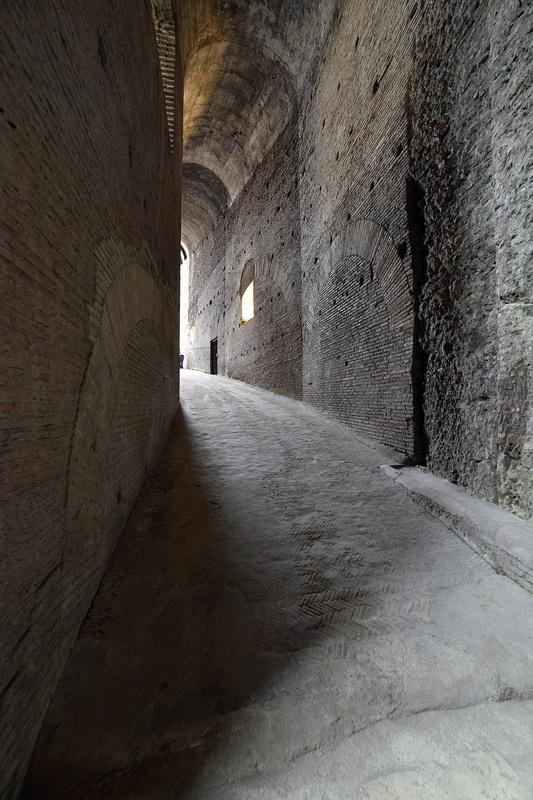 When he unearthed the imperial ramp of Domitian, he set about restoring it almost as soon as he found it, rebuilding the fallen brickwork of the vast vaulted ceilings of the first two levels and clearing the path all the way through to its connecting point with the Clivus Victoriae, a sloping road that went uphill from the Velabro, a former swamp between the Tiber and the Forum, to the top of the Palatine. The section of the ramp linking to the Clivus is still undergoing work, but is scheduled to open to visitors in March. 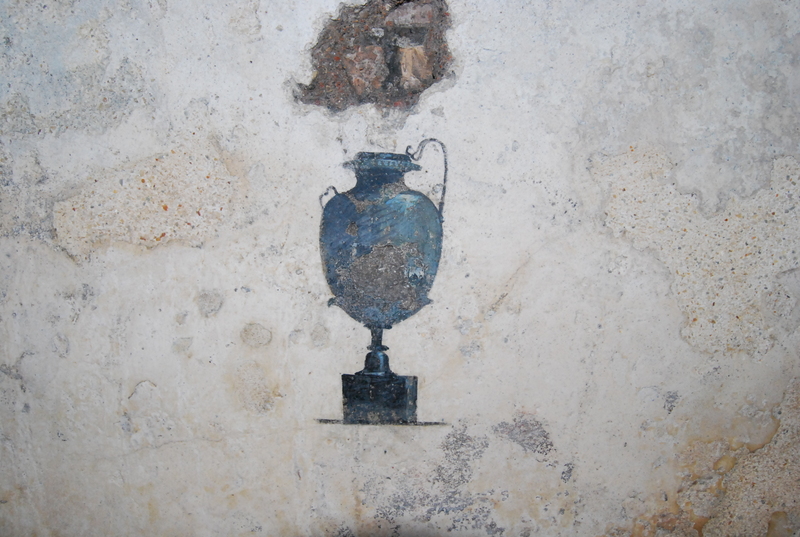 A temporary exhibition (it ends January 10th, 2016) inside the ramp puts on display a selection of the most important ancient artifacts discovered during the excavation of the Forum. 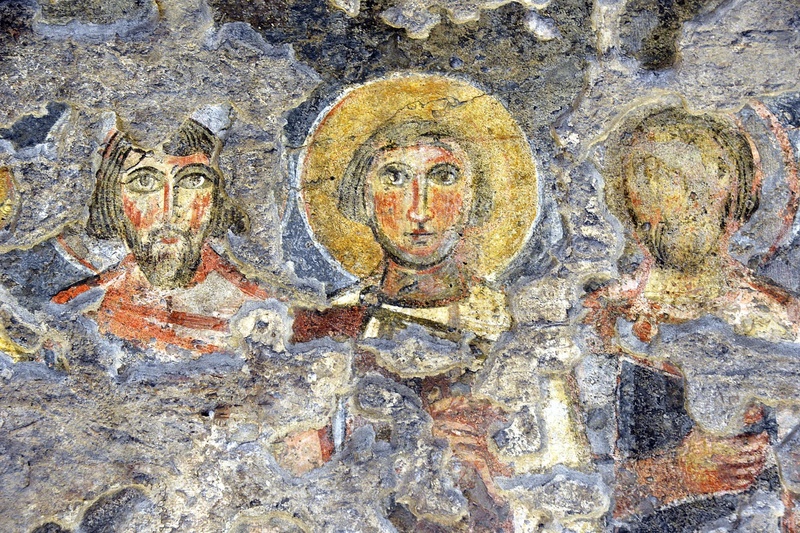 Also on display will be surviving 17th century wall frescos Boni stripped from the church of Santa Maria Liberatrice before demolishing it to expose the more ancient and glamorous Santa Maria Antiqua which had been part of Domitian’s imperial palace complex before being converted to a Christian church in the 6th century. The hall that would be transformed into the Oratorio of the Forty Martyrs, in fact, was just underneath Santa Maria Liberatrice. This short clip from the Archaeological Superintendency of Rome has a few images of the 1900 excavation and the ramp as it is today. 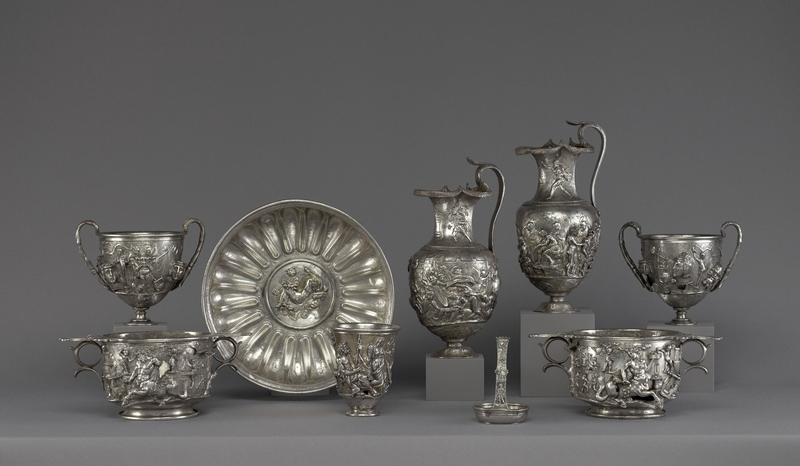 For the first time since it was discovered in 1830, the entire Berthouville Treasure, a group of exceptional Roman silver objects, has left France and is on display at the Getty Villa in Malibu. Ancient Luxury and the Roman Silver Treasure from Berthouville exhibits the complete 93-piece treasure — which includes a statue of Mercury, elaborately decorated silver pitchers and cups, a repoussé silver jug, plain silver beakers, a spoon collection and a number broken handles, rims and fittings — along with a selection of luxurious jewels, like the eight gold, emerald, pearl and amethyst necklaces of the Treasure of Naix, all on loan from the Département des Monnaies, Médailles et Antiques (the department of coins, medals and antiques) of the Bibliothèque Nationale de France. On March 21st, 1830, farmer Prosper Taurin was working his field in Berthouville, near Bernay, Normandy, when his plowshare jammed against an ancient Roman tile. Once dislodged, the tile was found to be protecting a trove of 95 or so Roman silver and gold objects buried only eight inches beneath the soil. 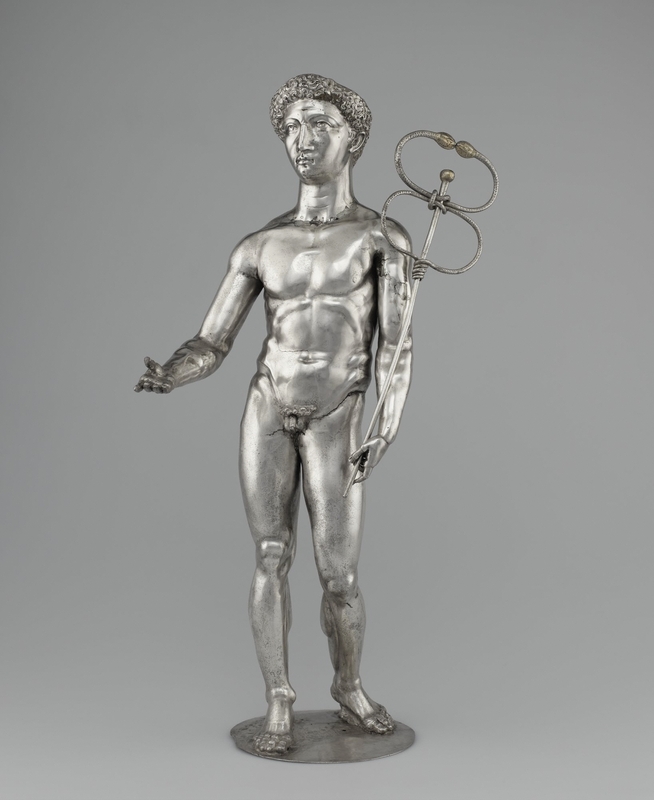 Weighing a total of 55 pounds, the stand-out pieces were two statuettes of the god Mercury and about 60 vessels. 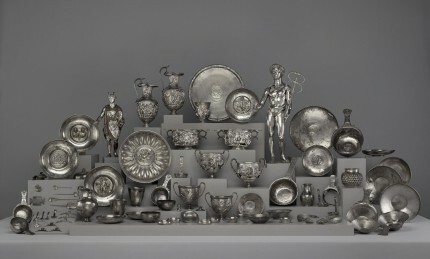 Several of the vessels were incscribed with votive dedications to Mercury, including a group of nine ultra deluxe gilded silver vessels — a pair of wine pitchers with scenes from the Trojan War, a pair of drinking cups decorated with scenes of centaurs, a pair of drinking cups with masks, a silver and gold beaker with scenes from the story of Corinth and Isthmia, a large bowl with a central medallion of Omphale and Eros laying on Hercules’ Nemean lion skin and a ladle decorated with Mercury, a goat and a tree — made in the 1st century. 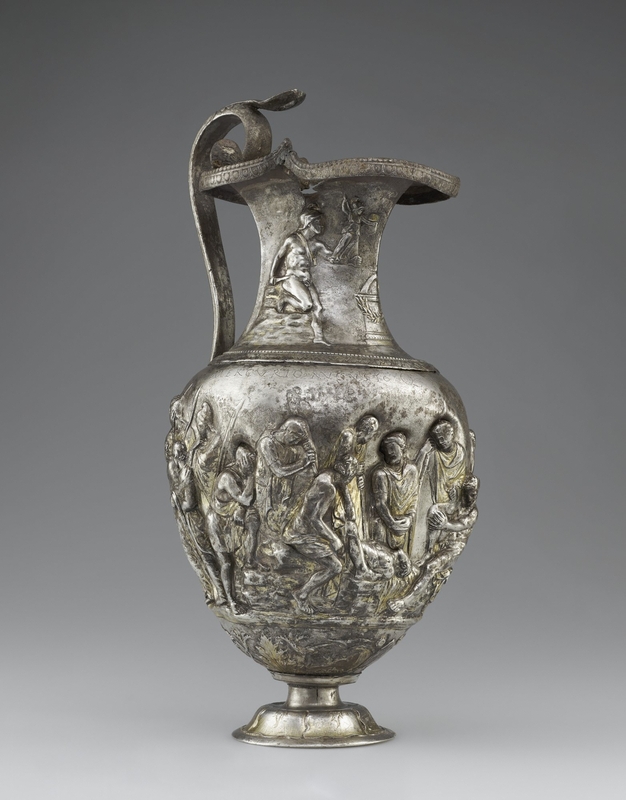 These nine pieces all bear the inscription “MERCVRIO AVGVSTO Q DOMITIVS TVTVS EX VOTO,” or “To August Mercury from Quintus Domitius Tutus as vowed,” and are superlatively high quality silver and gold work from 1st century Italy. Subsequent archaeological excavations of the site in 1861 and 1896 found two temples, a theater and hypocaust-heated rooms: a Gallo-Roman sanctuary built in at least two stages. 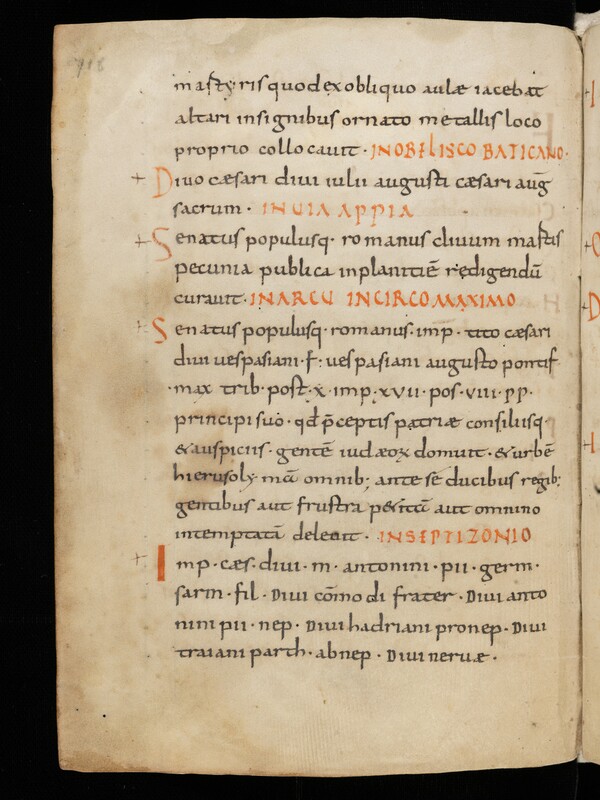 One of the temples was dedicated to the important Romanized Gallic deity Mercury Canetonensis, the same god name-checked in the vessels’ votive inscriptions. The other was dedicated either to his mother Maia or his wife Rosmerta. The hoard was buried under the brick paving in the gallery of the sanctuary. Archaeologists did not encounter evidence of a town or cemetery in the vicinity of the sanctuary, so it seems likely to have been a pilgrimage site. The objects date from the 1st to the late 2nd centuries A.D. and are therefore thought to have been buried in the late 2nd, early 3rd century. They could have been buried for their own preservation during turbulent times, but given the context they may have been cached for ritual purposes rather than under extremis. 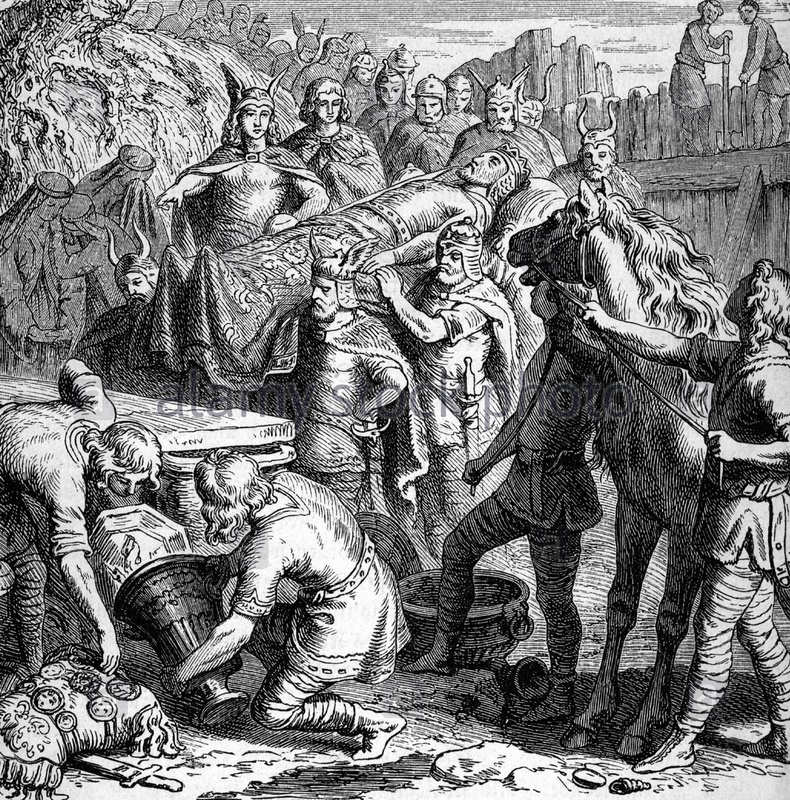 Taurin put the treasure in the hands of a local nobleman who prevented archaeologists from examining it. An expert from the Louvre and one from the Cabinet des Médailles of the Bibliothèque Royale, today the Département des Monnaies, Médailles et Antiques of the Bibliothèque Nationale de France, were allowed access to the group to arrange a sale. 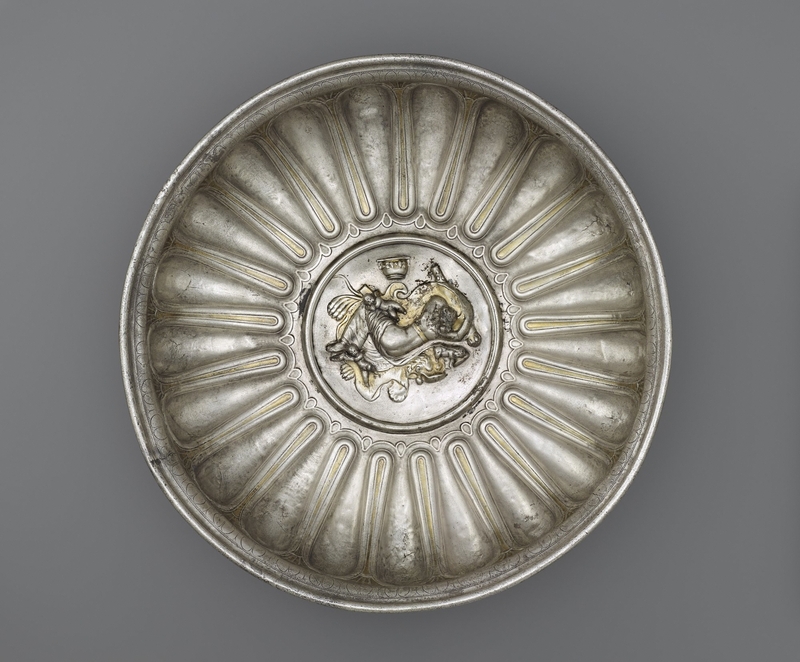 The Cabinet acquired the treasure for 15,000 francs, a modest sum even then. At the library in Paris the objects were cleaned and the fragments that could be puzzled back together were. There the Berthouville Treasure remained (with some individual pieces taking occasional short trips elsewhere in France) for 180 years. 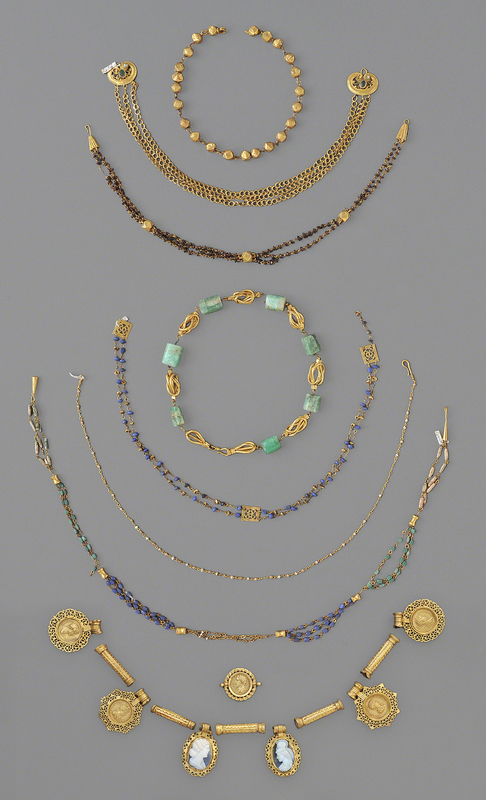 In December of 2010, the whole treasure was shipped to the Getty Villa for an extensive program of documentation, analysis, research, cleaning and conservation. 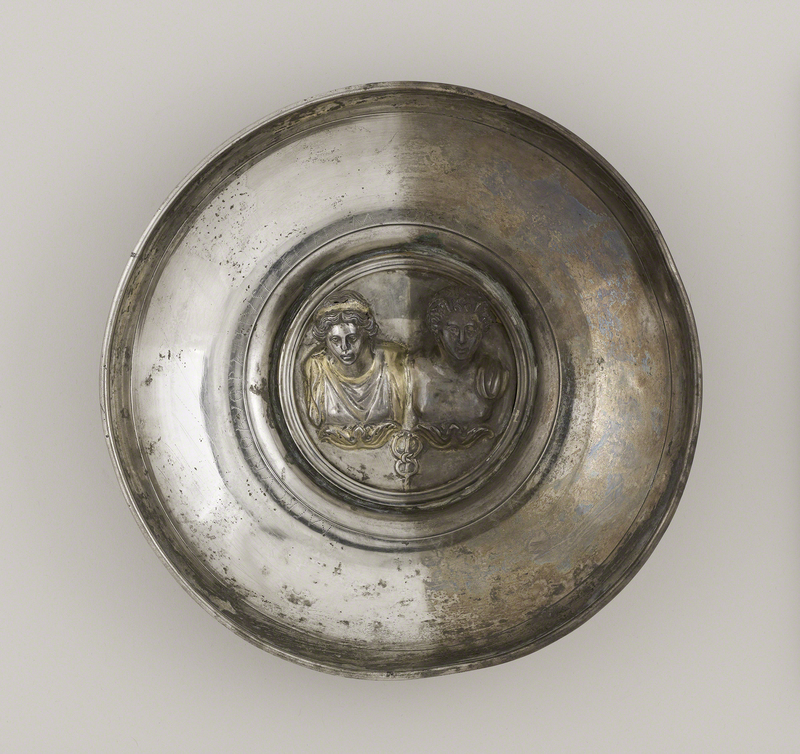 Each of the 93 objects (plus four unrelated platters from late antiquity in the Cabinet collection) were photographed and X-rayed to assess their condition and for evidence of how they were manufactured. After a metallurgic study, conservators began to clean the surface of the vessels with simple damp cotton swabs. The grime and dust removal promptly revealed gilding and inscription details that had long been obscured. Further progress was made with mild cleansers and solvents like acetone and ethanol which were able to remove the thick tarnish layers, accretions and corrosion that the 19th century conservation had been unable to budge. The restoration project took four years to complete and the beautiful results are now on display in California. 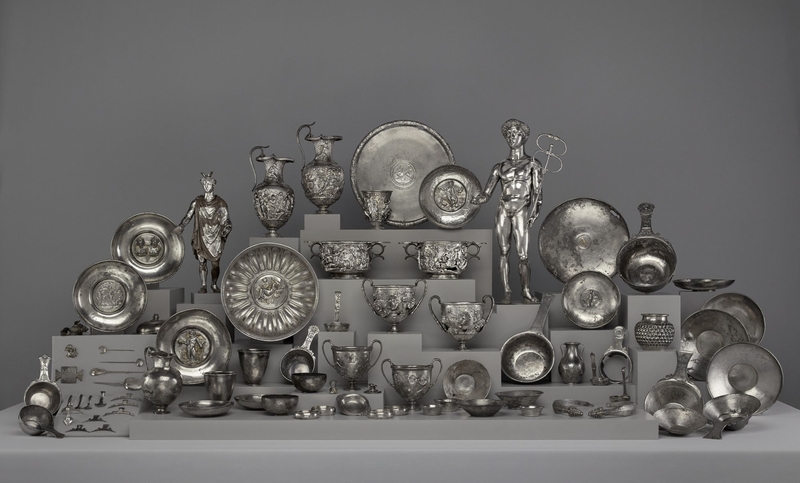 The exhibition runs at the Getty Villa through August 17th, 2015, after which it returns to Paris whose citoyens will get a chance to see the treasure clean and shiny for the first time. 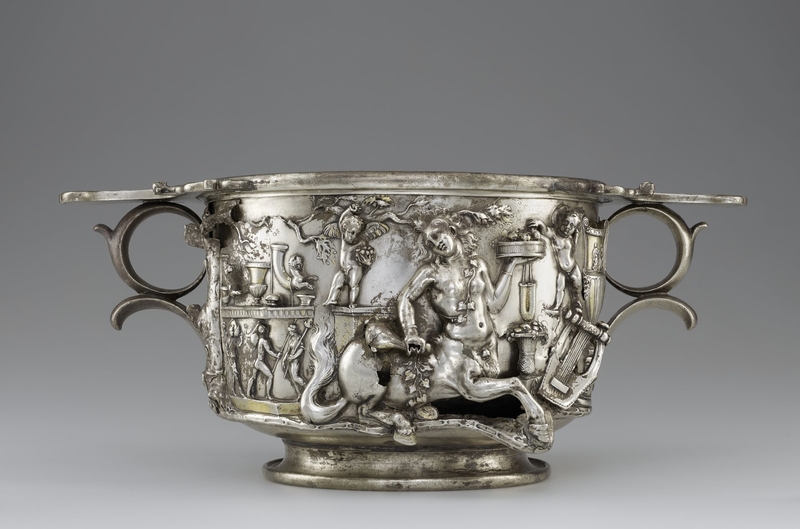 Here’s a nifty video from the Getty conservation team on how Roman silversmiths would have made the Cup of the Centaurs. 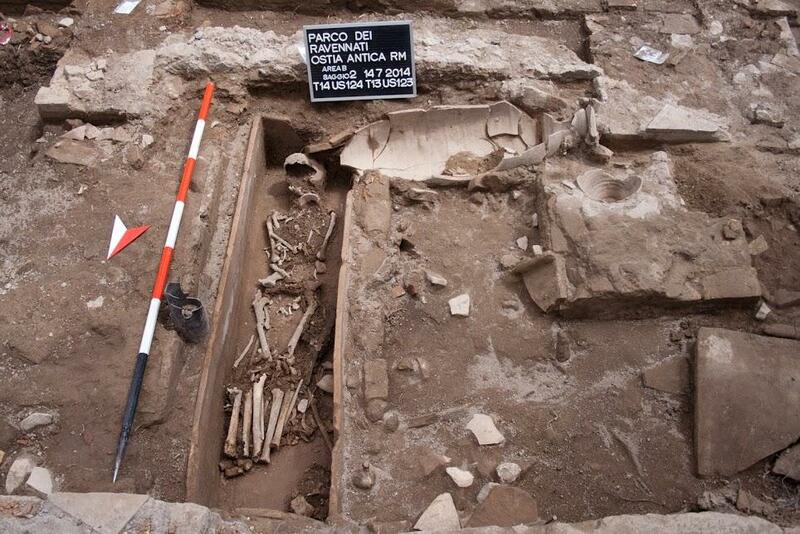 Excavations in Ostia, the ancient Roman harbour town at the mouth of the Tiber, have unearthed a group of more than 12 tombs from the 3rd-4th century A.D. Underscoring the cultural diversity of the port city, the necropolis includes inhumations and cremations, some right next to each other. The newly unearthed tombs are early Christian and surround a central tomb that belonged to someone of religious or social significance. The central tomb is a circular mausoleum lined in travertine that was originally built in the late Republican era and was reused in late antiquity. 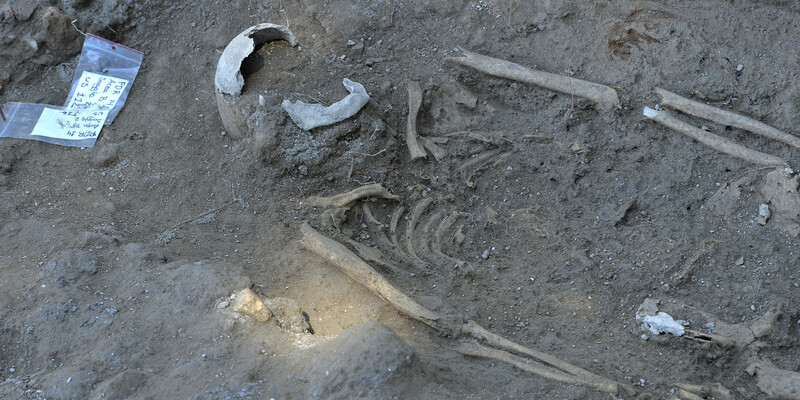 Archaeologists believe it may be an extended family unit who wanted to be buried at an important location, perhaps associated with one of the saints buried in early Christian Ostia. The area being excavated, Parco dei Ravennati, was a suburb of the ancient city of Ostia on the left bank of the Tiber, now long since silted over. 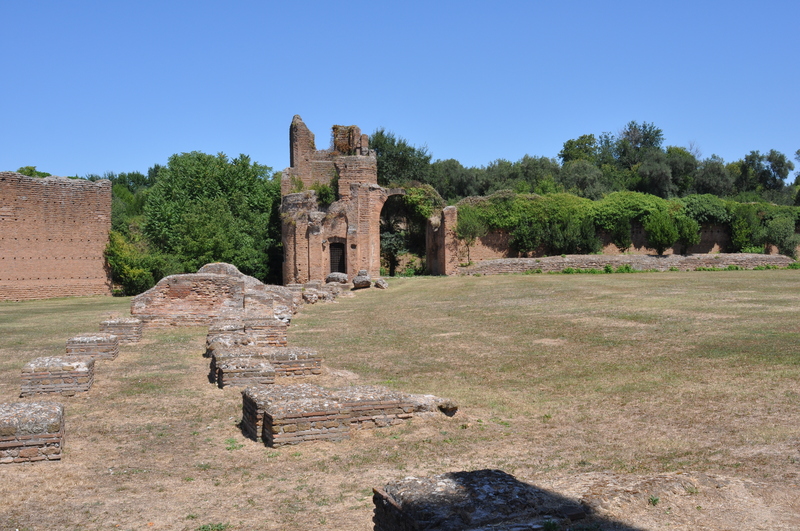 The area was used as a necropolis from the early imperial era through the 5th century when a basilica was built around the nearby tomb of 3rd century martyr Saint Aurea, patron saint of Ostia. The church was extensively renovated over the centuries; the current building was built by the Giuliano della Rovere, the future Pope Julius II, commissioner of Michelangelo’s Sistine Chapel frescoes, in the 15th century. Another important saint, Saint Monica, mother of Saint Augustine, died in Ostia in the late 4th century and was buried there. Her remains were moved to the Saint Aurea church in the 6th century before moving again to the Church of Saint Augustine in Rome. There may be more information on the burials forthcoming courtesy of some inscriptions. Additionally, several tombs had funerary inscriptions and archaeologists found a possible tabella defixionum, a lead curse tablet intended to protect the dead and bring anathema to tomb desecrators. 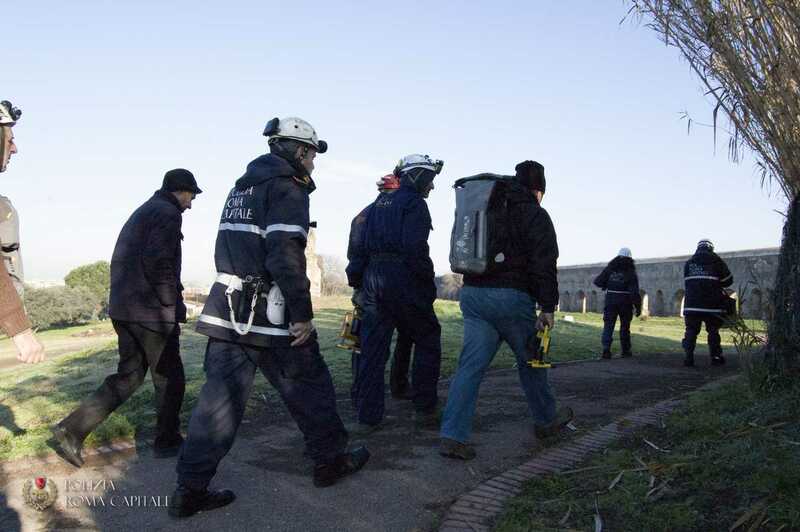 “They were really horrible curses to protect the dead”, Paola Germoni, head of Ostia’s archaeological superintendency, added. 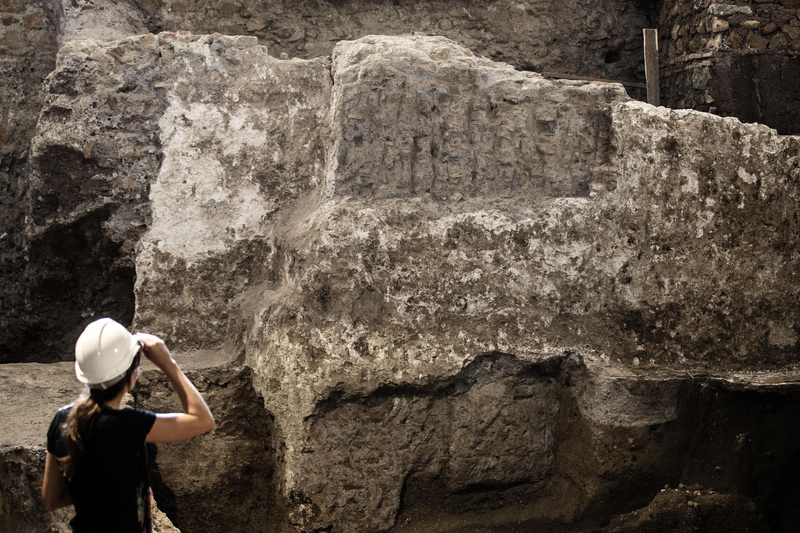 Studies remain ongoing, according to Michele Raddi, excavation co-director, who said “we found a number of fragmentary inscriptions in the tombs as well as a possible tabella defixionum, but we need to evaluate its context and see if it has an inscription”. Parco dei Ravennati wasn’t just a necropolis, however. Multiple domestic spaces have been unearthed, including an elaborate opus sectile marble inlay floor from the late 4th century. 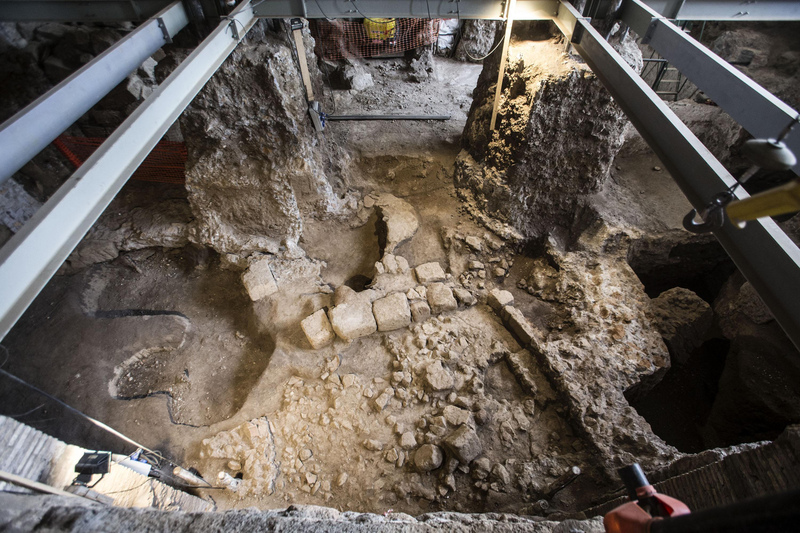 This season’s excavations have found even more of that aristocratic home, a space adjacent to the opus sectile room that was paved with paving stones and converted to commercial use. The discovery of hooks and lead weights from fishing nets suggest the elegant home was re-purposed for fish processing in the early Middle Ages. Ancient sources and earlier archaeology pointed to Ostia being in steep decline as a commercial center starting in the reign of Constantine I (306-337 A.D.), so the discovery of active businesses from the early Middle Ages is going to change what we know about Ostia. 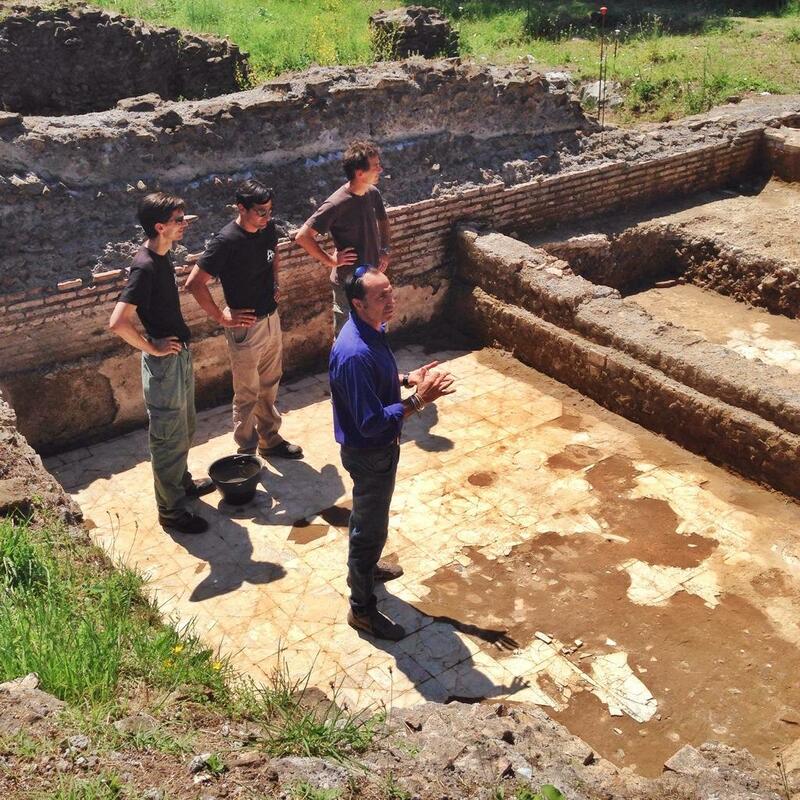 “What’s amazing is that you have continual use in this park straight through from republic and imperial times through to the Middle Ages and the Renaissance, its giving us precious information about the later periods and how it relates to Ostia Antica”, [director of the American Institute for Roman Culture Darius] Arya said. 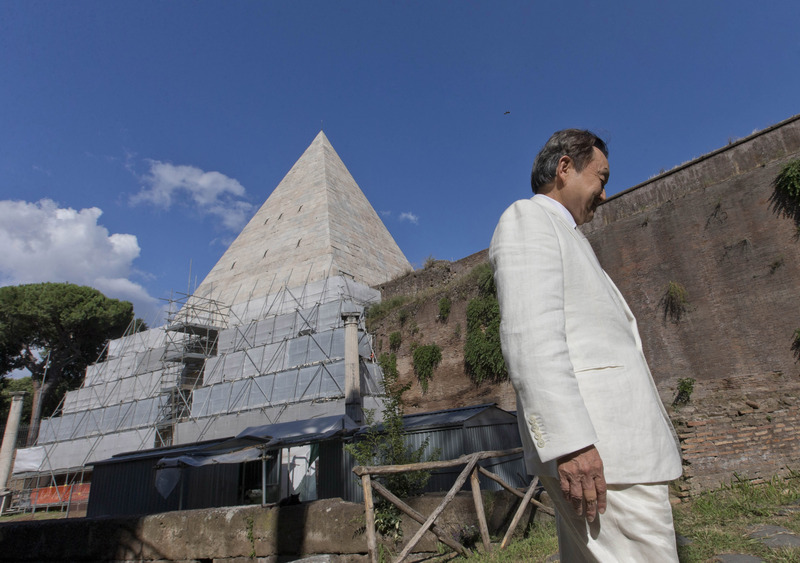 In December of 2011, Japanese retail clothing mogul Yuzo Yagi offered to donate €1 million to restore the tomb of Gaius Cestius, a pointy marble-clad vanity pyramid built in Rome in the 1st century B.C. At the time, the agreement was scheduled to be signed in January of 2012 and work to start in April, but the donation agreement didn’t get signed until March, the scaffolding didn’t begin to go up until November and it wasn’t finished until February. Actual restoration work began in March of 2013. Then in a shocking twist, it was completed five months early. The Culture Ministry contacted Yuzo Yagi and asked him to donate another million euros for a second stage of restoration that would return the Carrara marble cladding to its original whiteness as opposed to its longstanding grimy gray. White happens to be Mr. Yagi’s favorite color — he is known for his stylish all-white ensembles — so he was happy to double his original donation. In December of 2013 he signed a second donation agreement, again requiring nothing more than a discreet plaque near, not on, the pyramid, naming him as the donor. 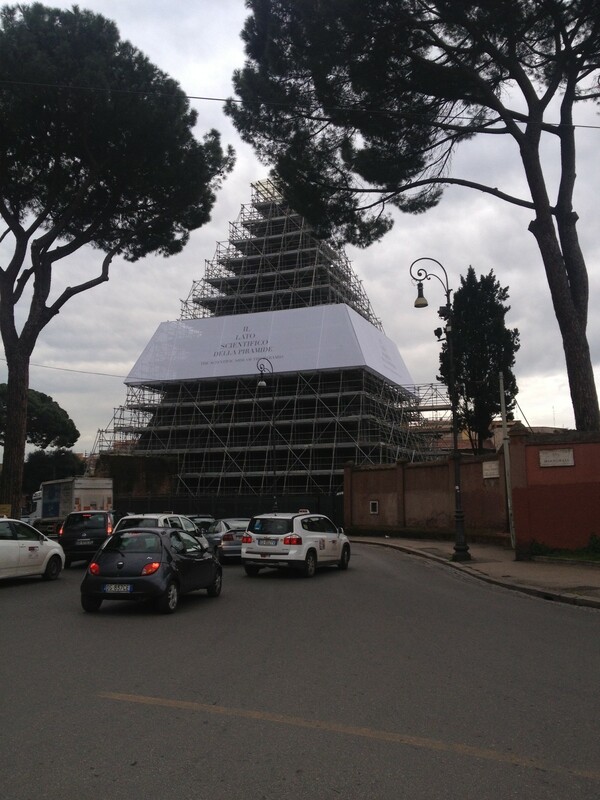 Even during the restoration the only signs on the pyramid are informational billboards at ground level and white banners assigning themes to each side — the mystical side, the scientific side, the historical side and the secret side. 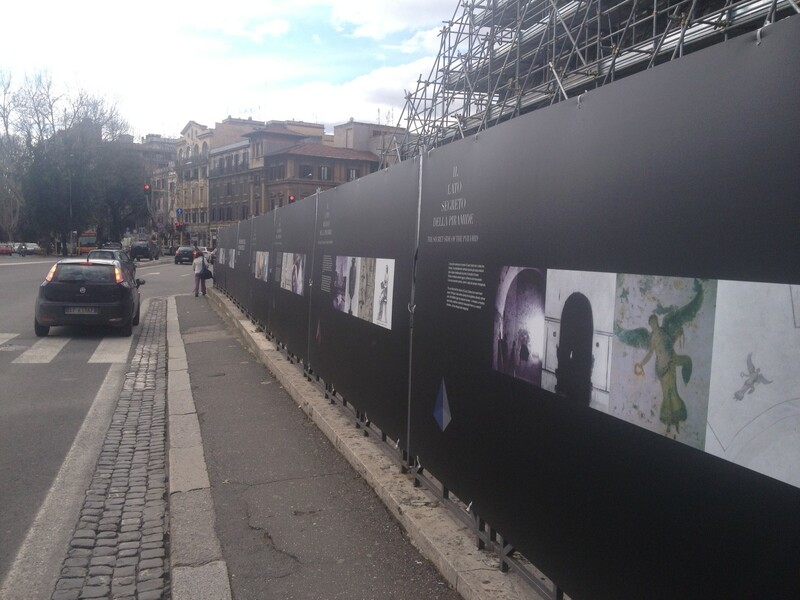 The billboards explain the history of the pyramid through these four themes. Yagi’s company gets credit for his patronage on the billboards, but just in discreet text lines. No logos or glaring anything. 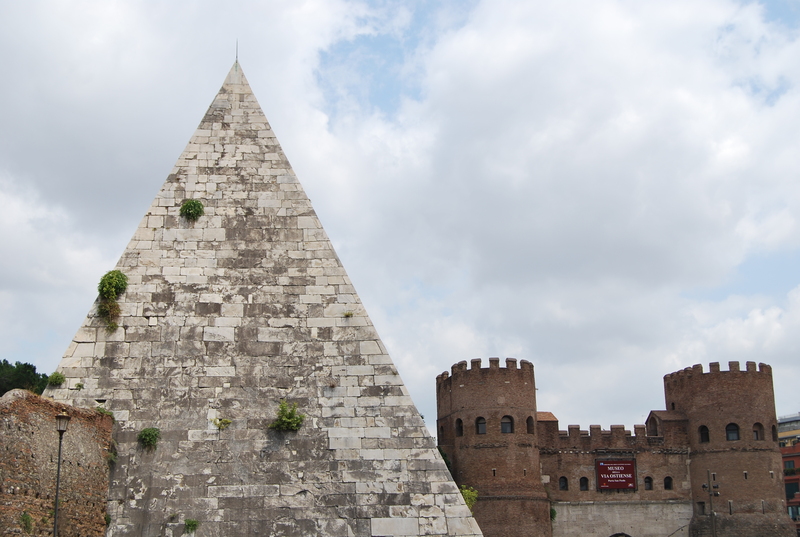 The images of the pyramid and information of its background dominate completely. Masterpiece Theater is more cluttered than that, like by a lot. Now phase two is well on the way to being finished and they’re ahead of schedule again. Restorers expect to be done three months before the expected November deadline. The early finish means Yagi isn’t ready for an inauguration ceremony. He’s thinking of just waiting until next summer and making a big event. He’s also so pleased with how this venture has gone that he’s contemplating donating more money for the preservation of another monument. 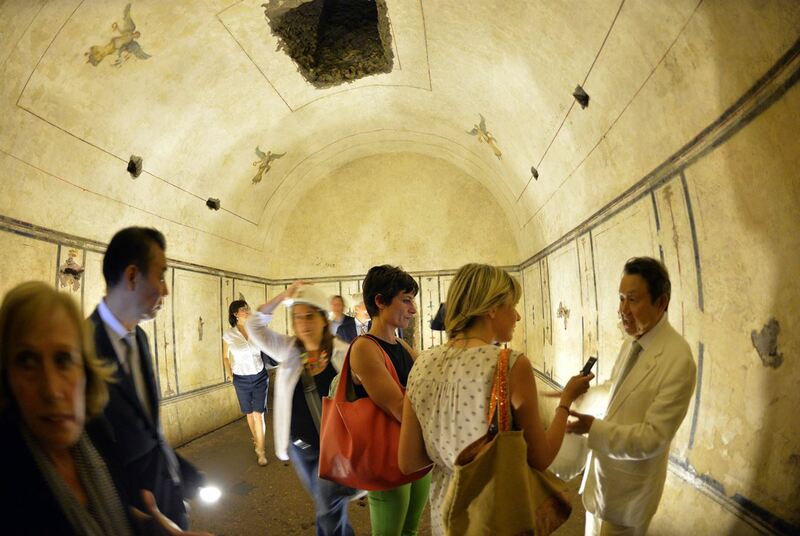 Yuzo Yagi toured the pyramid on Tuesday, accompanied by Culture Minister Dario Franceschini, who took the opportunity to promote Mr. Yagi’s dignified generosity as a model for future donors and to tout the state’s new tax incentives for businesses who donate to cultural heritage projects. Oh man, I want to wear a hardhat and go inside! If the burial chamber looks modest it’s because Augustus’ sumptuary law of 18 B.C. forbade ostentatious luxury in tombs. Unlike the Egyptians whose tombs he modeled his own after, Gaius Cestius was not buried with lavish treasures to accompany him to the afterlife. He got white walls with small frescoes of alternating winged Victories and ceremonial vessels, plus a few bronze statues of him outside the pyramid. The frescoes were in serious danger from water leaking through the marble slabs into the brick and concrete structure. Those leaks have all been plugged now. Also gone are the severe microorganism infestation that was making a meal of the marble and the copious vegetation sprouting through the damaged exterior walls. The pyramid hasn’t looked this good or been this healthy since it was built, I wager. Here’s a 3D animation of a point cloud generated from laser scan data before the scaffolding went up. 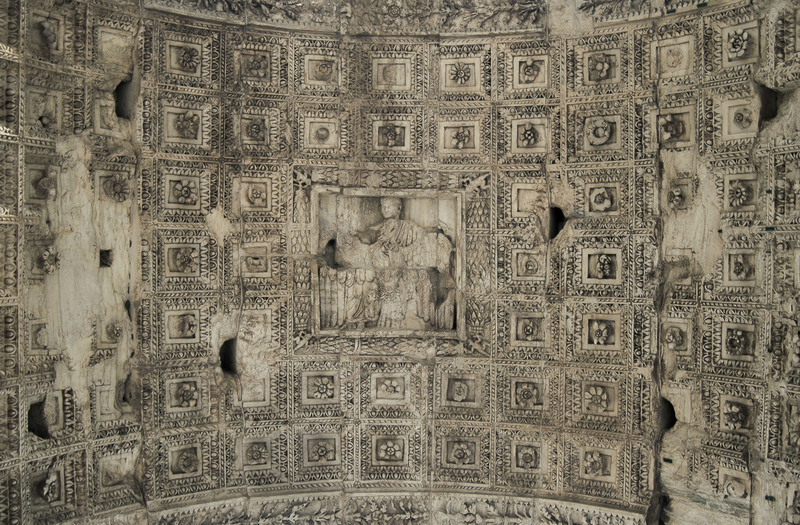 It gave restorers a clear picture of the condition of all four sides, the deterioration of the marble cladding, any unevenness in the surface or cracks and evidence of shear. 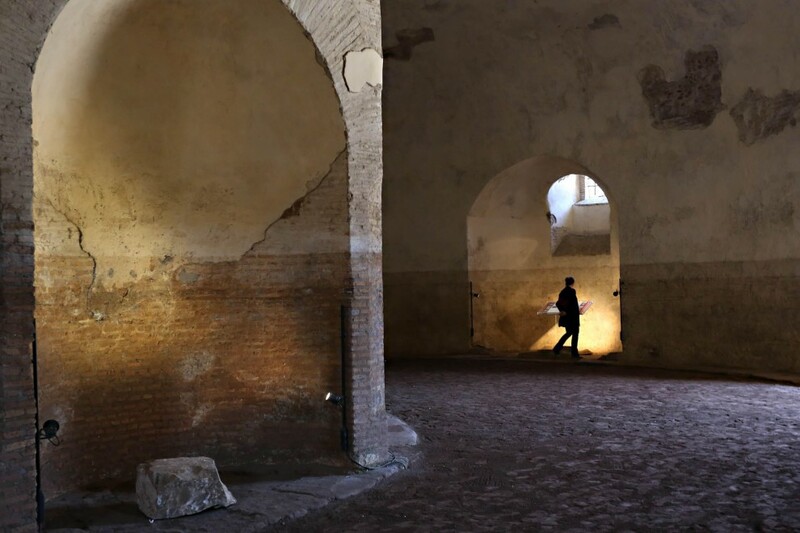 The Mausoleum of Valerius Romulus, son of the Roman Emperor Maxentius, reopened to the public Monday after 20 years of restoration. 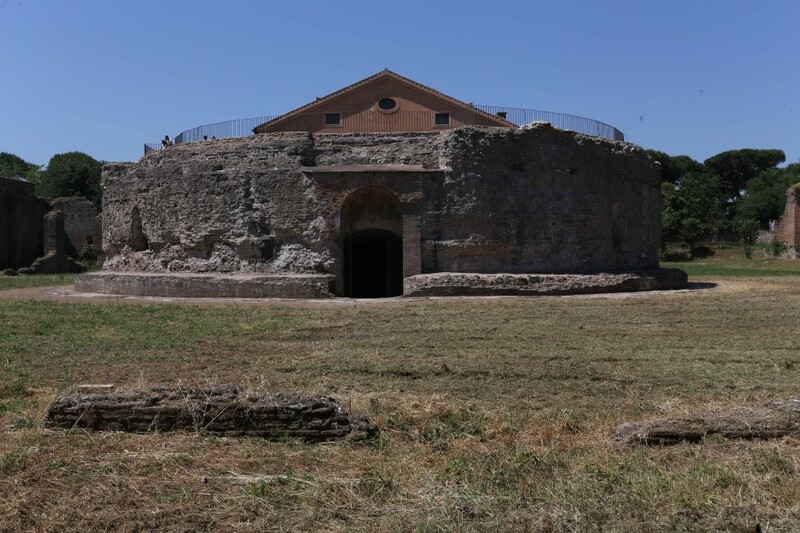 The large circular structure was built by Maxentius in the early 4th century, probably as a family tomb, on the Appian Way. When his young son died around 309 A.D. — he is said to have drowned in the Tiber — he was buried in the mausoleum. The tomb was part of a large imperial complex that included Maxentius’ palace and a circus for chariot racing. Little of the palace is still standing, while the mausoleum has lost its second level but is still an impressive structure, inside and out. It is surrounded by a quadroporticus on the outside with its main entrance on the Via Appia and two smaller entrances facing the palace and the circus. 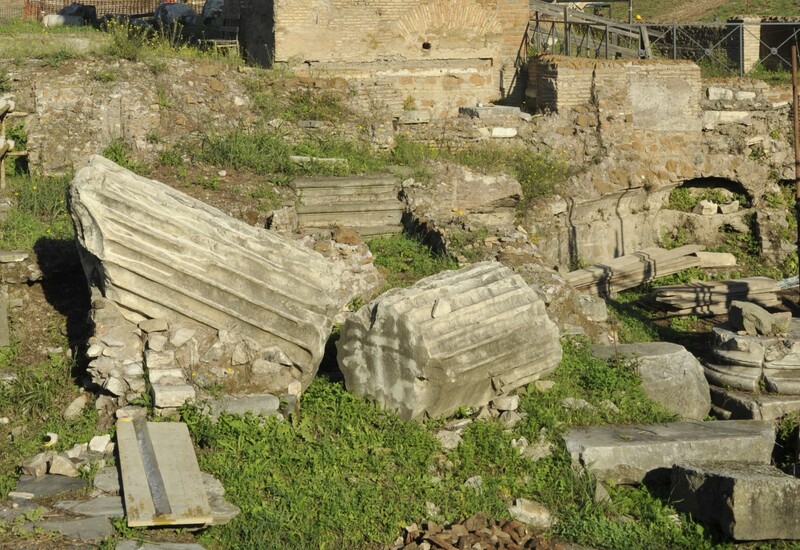 On the mausoleum itself, the main entrance facing the Appia was walled up centuries ago. It has now been reopened in the recent restoration. Inside, the crypt has a large central pillar with a circular corridor onto which open niches where the sarcophagi of the royal family would have been deposited. A spacious vestibule connected to the corridor probably once led to the second floor. There’s an 18th century brick home attached to the back of the mausoleum that was originally a farmhouse for use when the property was dedicated to agricultural purposes. It was later converted into a home for personal use by the princely Torlonia family, who owned the land before it was requisitioned by the Fascist government in 1943. The circus, while in ruins, is the best preserved of its kind, with pieces of all its major architectural components extant. 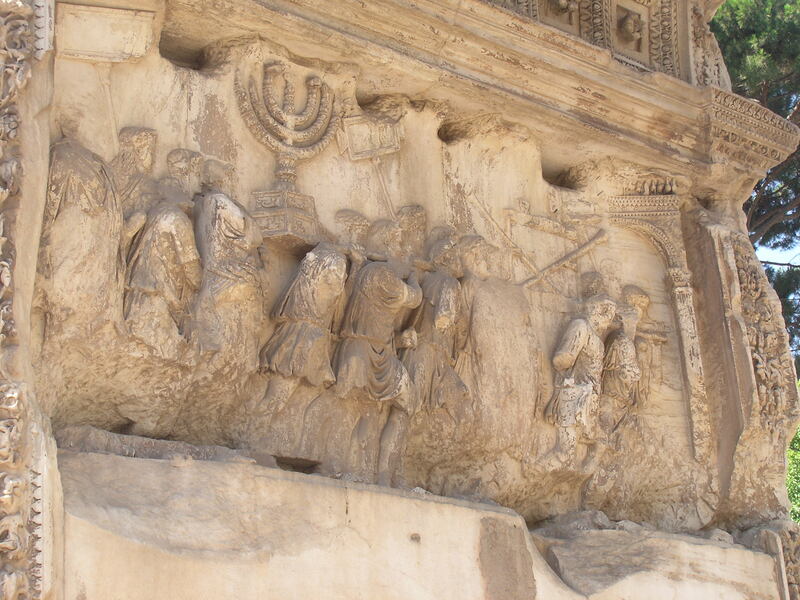 Two of its gate towers have survived, as have the remains of the starting gates, the spina (the central median around which the chariots turned), and a triumphal arch. It’s also the second largest circus after the Circus Maximus at 500 meters (1640 feet) long and 90 meters (295 feet) wide. There was room in the stands for as many as 10,000 spectators to watch the races. 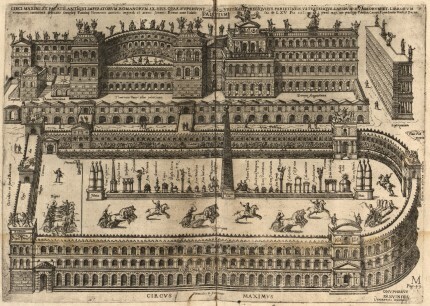 Parts of the circus were excavated by archaeologist Antonio Nibby in 1825, who unearthed a marble inscription dedicating the inaugural games to the deified Valerius Romulus, clarissimus puer (most highly regarded boy), nobilissimus vir (most noble man), twice consul of Rome, son of Maxentius the undefeated Augustus, grandson of the divine Maximian. 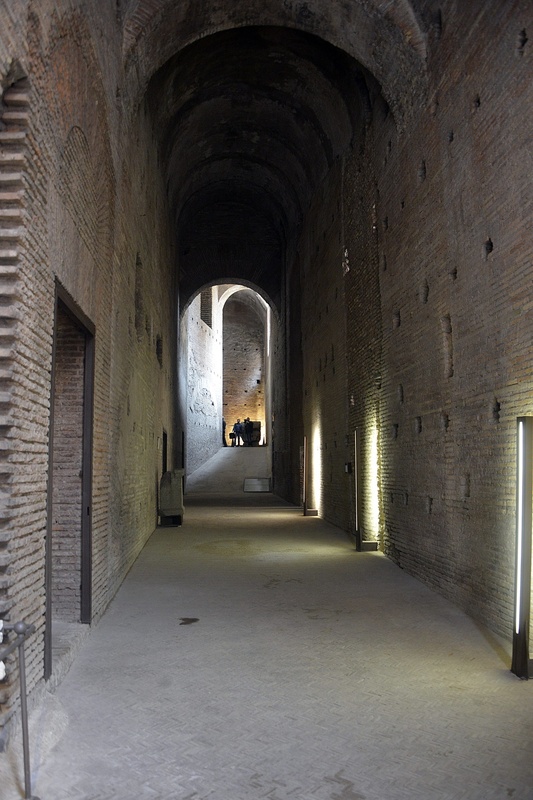 Before that discovery, the circus was thought to have been Caracalla’s doing. Maxentius would have been very put out to find his construction project attributed to another emperor. 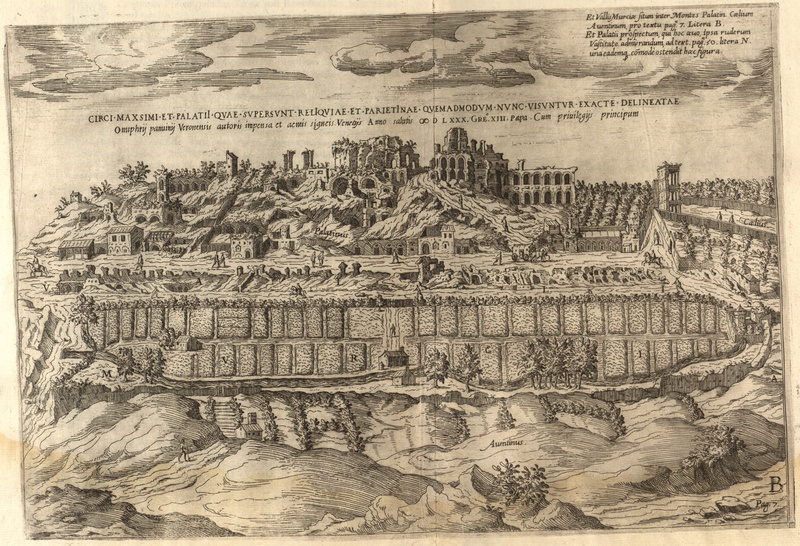 The Appia complex was part of a major effort on his part to legitimize his usurpation of the throne through the revival of great building in the city of Rome. 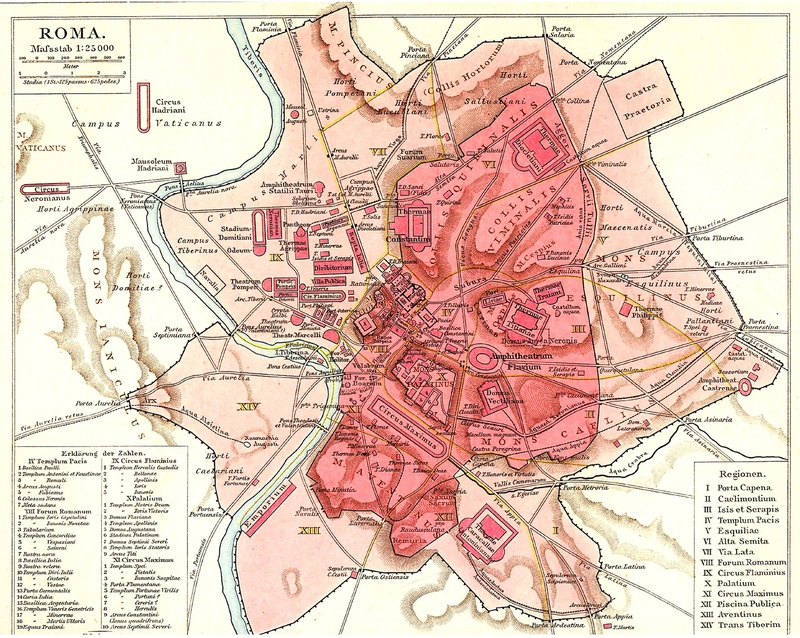 In the years before the Praetorian Guard made Maxentius, formerly a Caesar or junior emperor, Augustus, emperors like Diocletian, Maximian and Galerius had focused imperial construction on other cities: Nicomedia for Diocletian, Milan for Maximian, Salonica for Galerius. They brought the imperial court and administration to these cities, diminishing Rome’s political and architectural importance. With that in mind, Maxentius moved to build anew in Rome. 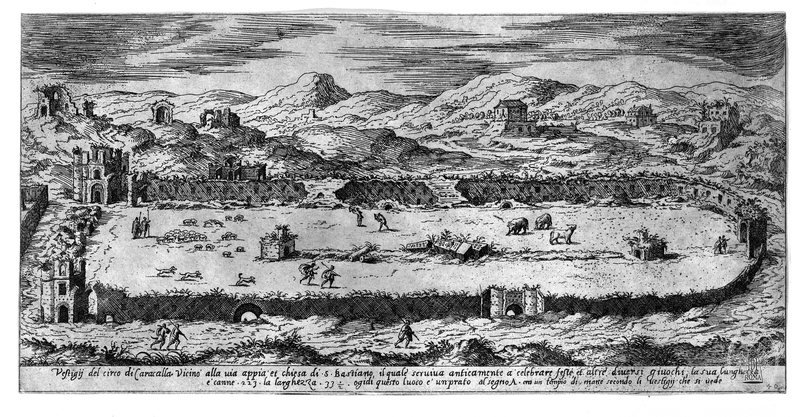 The Appian Way complex was intended to be a new administrative center, not just a compound for private fun. 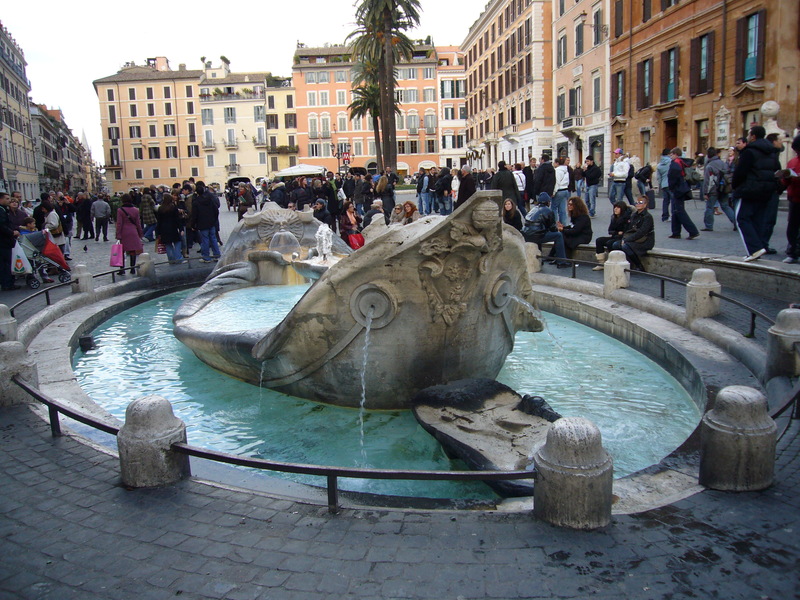 The choice to place it on the Appia, outside of the formal boundary of the city of Rome where the tombs of the wealthy had for centuries dotted the roadside, was a break with tradition. 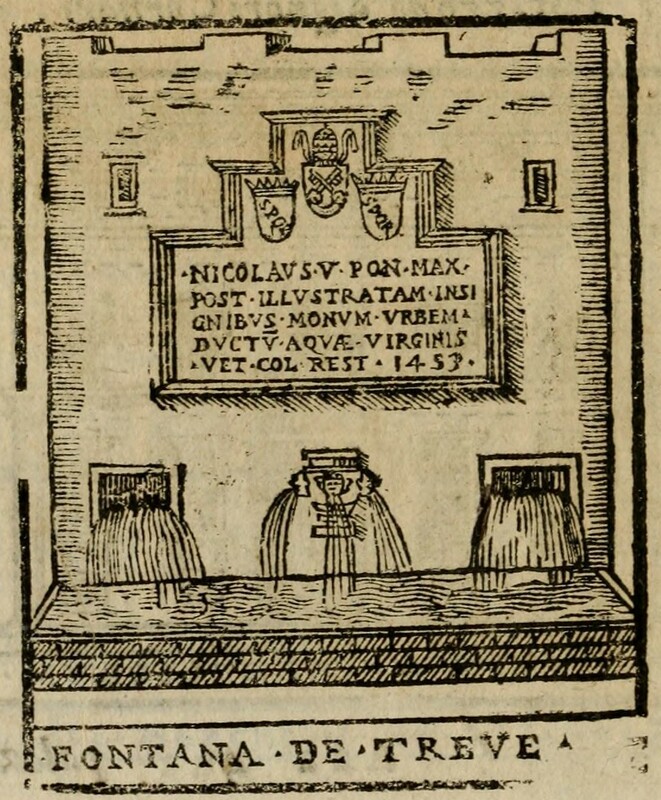 He may have decided to build out there because he wanted his dynastic tomb to be part of the complex, and according to Roman custom, all bodies had to be buried outside the city. You can take a look around the complex via satellite on Google Maps. To the right of the red marker are the circus ruins. Slightly up and to the left is the mausoleum.